Arrive in Auckland – the “City of Sails” is New Zealand’s largest city, bordered by two stunning harbours. Collect your rental car from the airport, explore the city, then make your way to your accommodation. Embark on a wholly unique adventure today—“The Squeeze.” First, take a scenic jet boat ride through the stunning Tutukau Gorge. Disembark in warm, knee-deep water and wade through a narrow gap in the cliff face. You’ll manoeuvre your way through narrow crevasses, over boulders, and through warm water until you emerge in stunning native bush. There, you’ll soak in the atmosphere while relaxing in the thermal waters of a naturally heated pool. 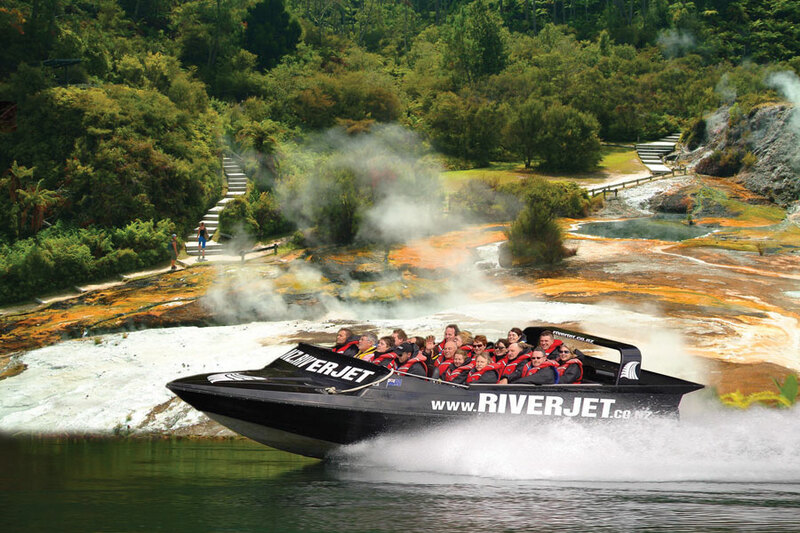 On the return journey, zip down the canyon on a thrilling jet boat ride! 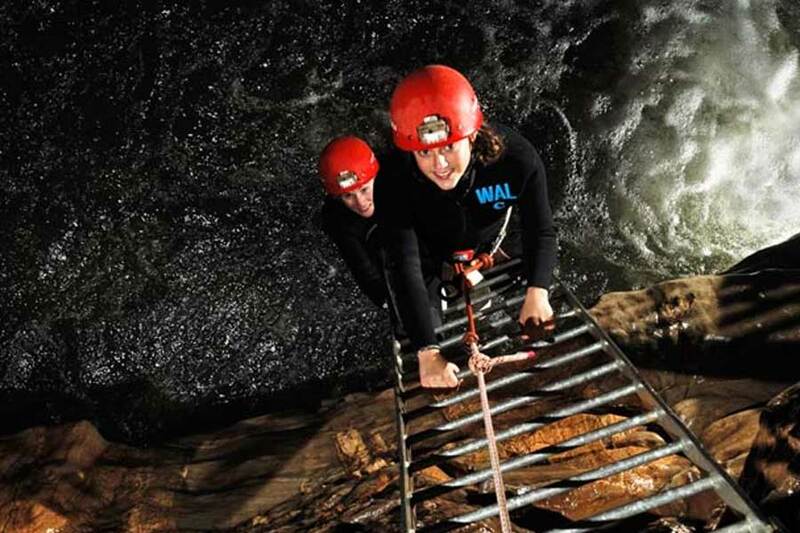 Make your way to Waitomo Caves, where you will venture underground on a thrilling Lost World Tour. Abseil down into one of the most spectacular abysses in the world before exploring the otherworldly reaches of the Lost World caves. See glowworms, fantastic limestone formations, and massive caverns as you make your way through the underground world. * Ages 10 and up only. An alternative option will be provided for younger children. Drive back to Auckland at your leisure. Relax in Auckland for the afternoon or join the crew and enjoy an America’s Cup sailing trip, a must-do experience where you get a chance to spend 2 hours out on the harbour on an actual America’s Cup yacht! 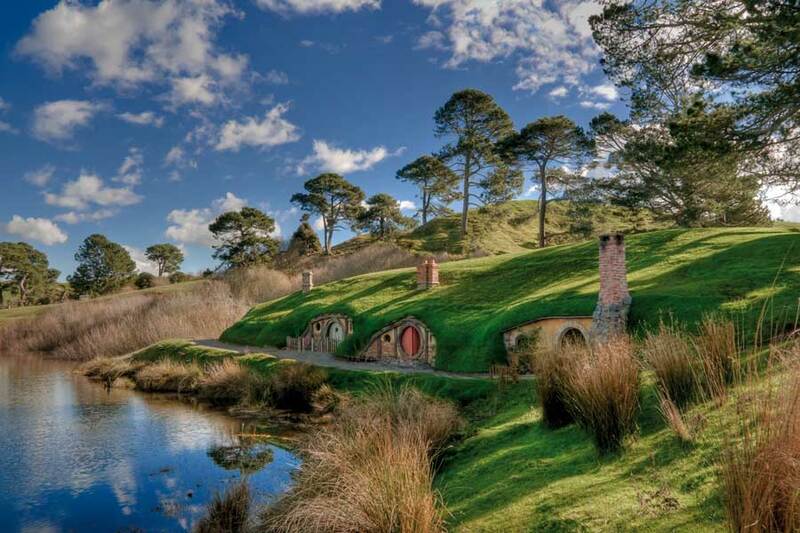 Today, depart Auckland for Queenstown on a domestic flight (cost of flight not included in holiday package). Please enquire for flight options and approximate costs. Arrive in Queenstown, collect your new rental car and make your way to your Queenstown accommodation. Relax and explore downtown Queenstown in the afternoon and evening. 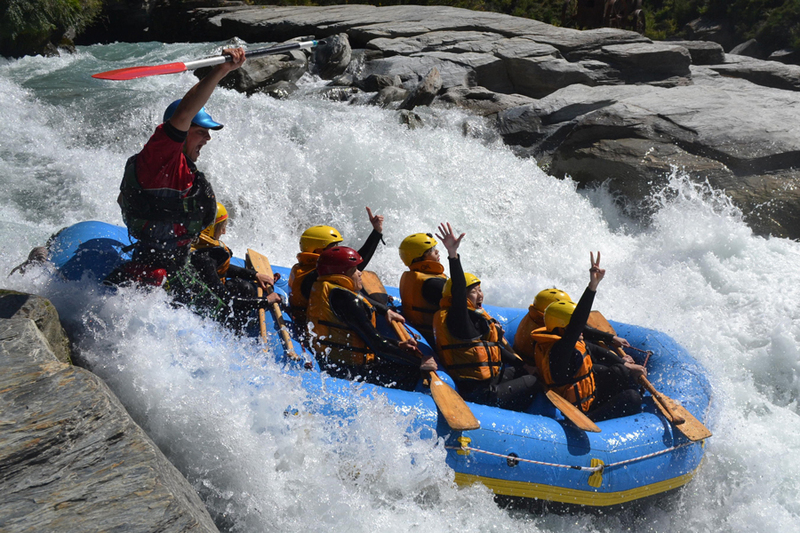 Conquer one of Queenstown’s rivers today with a thrilling whitewater rafting trip! 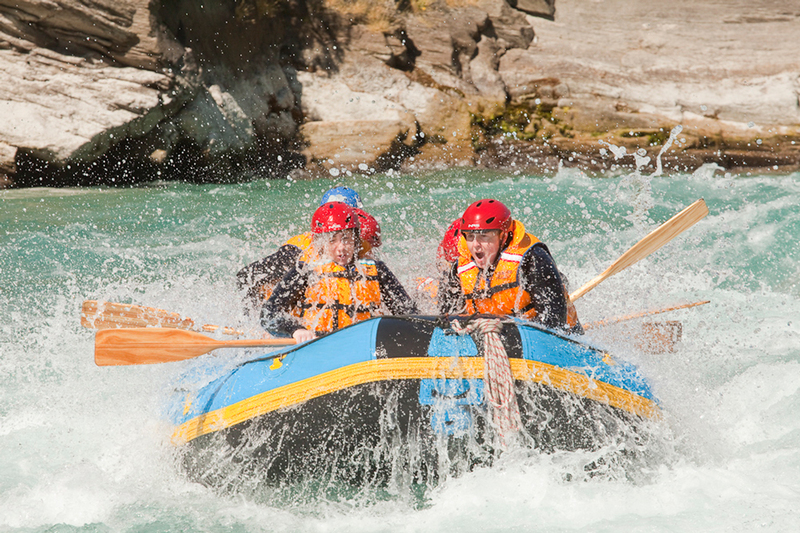 Choose from the Kawarau River (grade 2-3, beginner) or the Shotover River (grade 3-5, advanced). * Note: Ages 13 and up only. An alternative option will be provided for younger children. 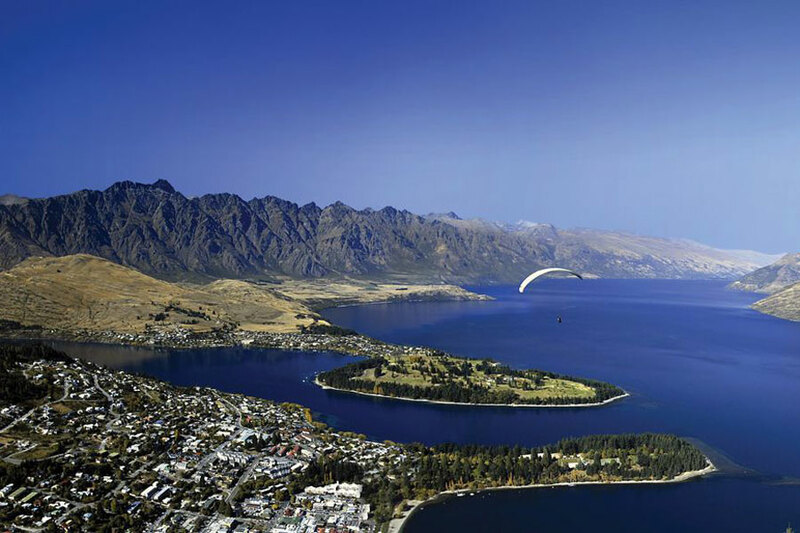 Relax and explore Queenstown today, or choose from an exciting range of optional activities including scenic flights, 4WD safaris, winery tours, jet boat rides, and more. Enjoy a scenic coach journey through heartland New Zealand to reach Milford Sound. The Milford Road (between Te Anau and Milford) is one of the finest alpine drives in the world. The scenery is exceptional, ranging from broad grassy flats, dense rainforest, and towering mountains through to glacial lakes and alpine herb fields. No other road in Fiordland offers such a diverse glimpse into New Zealand’s alpine zone. Your luxury coach has been purpose-built for travelling the Milford Road, incorporating the latest technology for comfort and safety. The seats are tiered and angled towards the windows to maximise your views, and the expansive glass roof provides breathtaking sights of the snow-capped peaks. The schedule includes plenty of time for short nature walks and photo opportunities along the way. 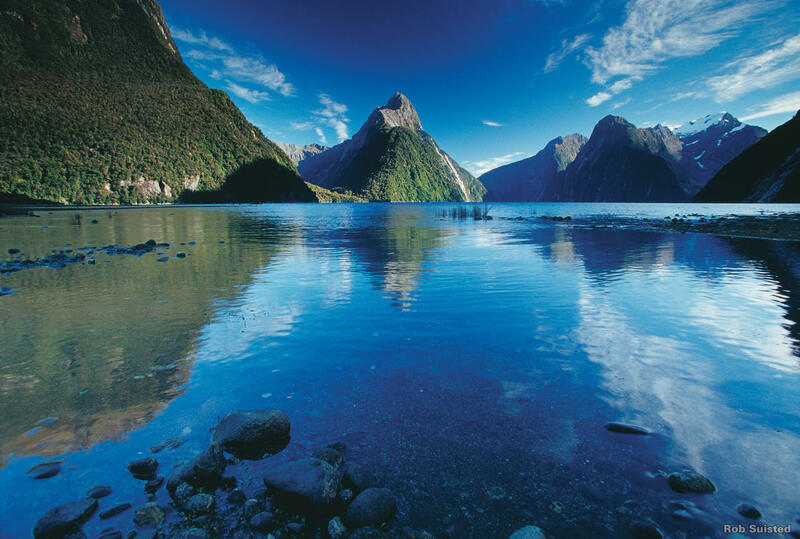 Upon reaching Milford Sound, you will enjoy a 2.5 hour Milford Sound Nature Cruise. 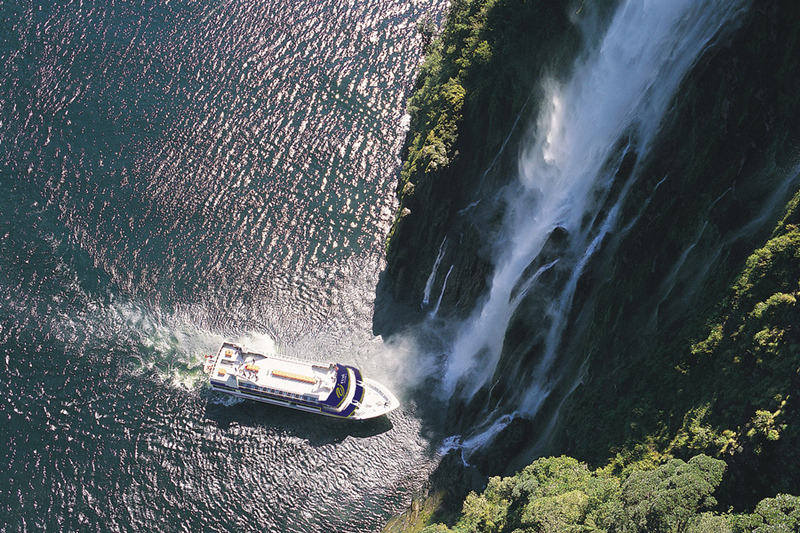 With specialist nature guides on board, Real Journeys Nature Cruises offer a close-up experience of Milford Sound’s rainforest, soaring rock walls, towering snow capped mountains, cascading waterfalls, hanging valleys and wildlife… words just don’t do it justice, you have to see it for yourself! Throughout the cruise, the guides share stories of the fiord’s history and are happy to answer your questions. After your cruise, relax while your coach delivers you back to your Queenstown accommodation. Drive over the beautiful Crown Range, New Zealand’s highest state highway, and admire the fantastic views along the way. Be sure to stop at the historic Cardrona Hotel for a refreshment before your arrival into Wanaka, an alpine town boasting panoramic views, a relaxed atmosphere and myriad walking tracks. Stay 1 night in Wanaka. Carry on, past Lake Hawea and the northern shores of Lake Wanaka, until you reach Haast Pass. There are many short walks and viewing points along the Haast Pass Highway, which will help break up the journey. Continue up the West Coast, with glimpses of the Tasman Sea showing beneath rugged cliffs, until you reach Franz Josef Glacier. 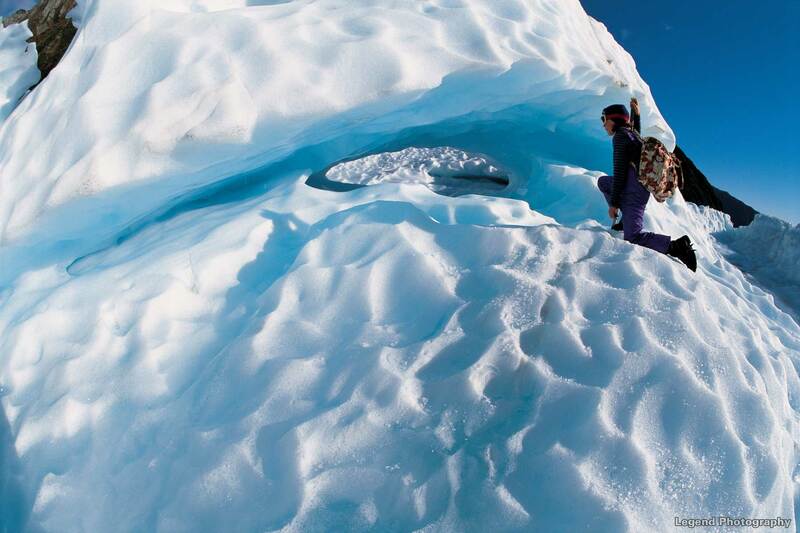 You may also wish to visit Fox Glacier itself, which is signposted and located just south of Fox Glacier township. Franz Josef is a short thirty minute drive north of Fox Glacier. Stay 2 nights in Franz Josef. 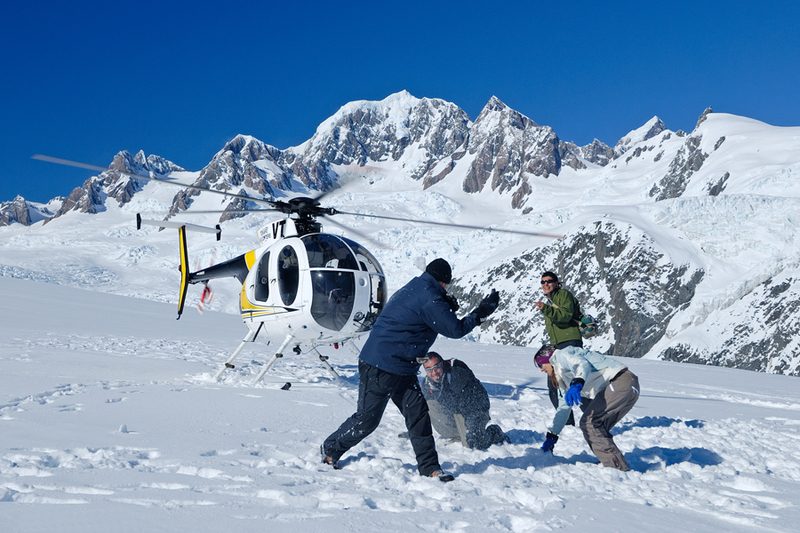 Take a short helicopter flight onto Franz Josef Glacier today, where you will explore the spectacular ice formations on a heli hike! Afterwards, soak in the Glacier Hot Pools to warm up after an exciting day on the ice. * Note: Ages 8 and up only. An alternative option will be provided for younger children. Enjoy your journey along the West Coast to Hokitika, famous for its arts and crafts. Watch a masterpiece being crafted from gold, molten glass, paua or bone, or carve your own creation from wood or jade (“pounamu”). Take in Hokitika’s natural beauty, enjoy its expansive beach, or venture down one of the many walking and mountain biking tracks. Make your way through the Southern Alps on your way to Christchurch. The trip through Arthur’s Pass will take you past towering mountains, snaking rivers, and rolling farmland. Along the way, be sure to stop at Cave Stream, where you can walk through a cave gouged into the hillside by the road, and Castle Hill, where you can scramble on a number of fascinating rock formations. In the evening, option to add on a nostalgic dinner on the Christchurch Tramway. Drop your rental car off at Christchurch Airport and depart Christchurch at your leisure.